Pan seared salmon with crispy skin is one of the easiest, tastiest and quickest salmon dinners. Gose beurre blanc sauce drizzled over pan seared salmon fillet. 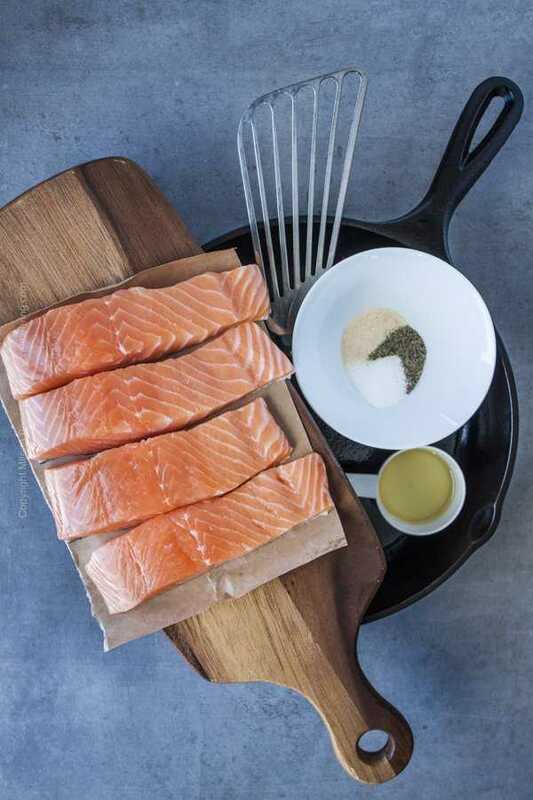 And – in our opinion pan searing is the best way to cook salmon. It works equally well with fatty Atlantic salmon, Chinook (King) salmon or Sockeye (Red) salmon. You can prepare a bigger fillet or sear several individually portioned pieces without altering the method. Serve the crispy skinned salmon straight out of the pan or drizzle it with a delicious sauce (see the Sauces for Salmon section below for a multitude of recipes). Only a few things – good quality salmon, cooking oil and seasonings and by way of equipment – oven safe stainless steel pan (or a cast iron skillet) plus a fish spatula. Atlantic salmon fillets, olive oil plus seasonings, a cast iron skillet and a fish spatula. An oven safe pan is essential in case you want to enlist a preheated 450 F oven as an ally in order to cook the salmon evenly and free up a stove burner to make a quick side or a sauce. The second essential tool for pan seared salmon – the fish spatula, makes handling the tender fish a breeze. Fish spatulas are inexpensive so if you don’t already own one consider adding it to your kitchen arsenal. 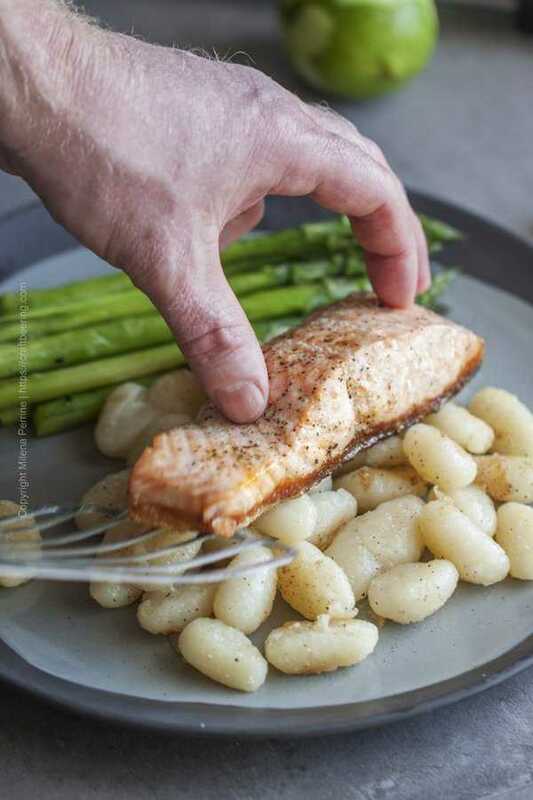 Their curved and thin edge easily slides underneath the salmon fillet and helps you flip it, transfer it out of the pan, serve it onto a plate or if necessary – easily remove the crispy skin. Before you pan sear the salmon – prepare it. Bring it to room temp, cut it in portions if needed, check for any small bones that were not removed, pat it dry and season it. Always season your salmon with salt and pepper (we also like to add garlic powder) even if you plan to smother it with the most scrumptious sauce later on or the shiniest of glazes. If you will not be making a sauce or a glaze consider the variety of delicious seasoning mixes for salmon available to infuse your fish with even more flavor while it is cooking. By definition searing is a technique in which the meat’s surface comes into contact with a very hot surface (pan, grill, etc.) and forms a flavorful crust in result (known as Maillard reaction). Searing requires the surface of the meat to be dry. In the case of salmon the skin helps it cook more evenly. Always cook salmon fillets skin side down. Not only will the skin become nice and crispy but it will be easier to slide the spatula under the skin to flip the fillets at the end and briefly cook their top side. Preheat the pan over medium-high, add oil and wait until it begins to shimmer and is just about to start smoking. 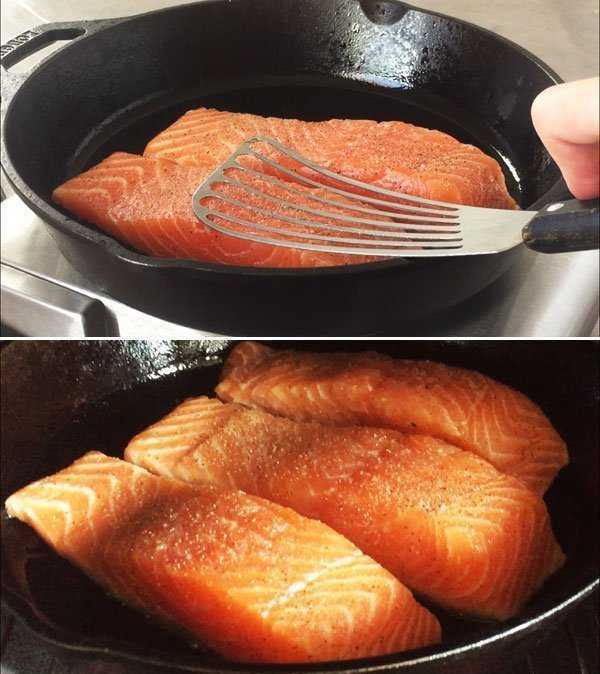 Place the salmon fillet(s) and gently press them down with the back of the fish spatula for a few seconds to prevent the skin from curling up upon contact with the hot pan. Sear in hot oil over medium-high heat and transfer to 450 F oven to finish. After searing the skin (about 30 seconds) it is very important to let the salmon cook evenly and all the way through. I prefer the oven. It is how Chris taught me to do it many years ago and it is what they commonly do in restaurants. The oven ensures the salmon cooks very evenly and frees up a stove burner that can be used to quickly saute veggies or make a pan sauce. You will know that the salmon is done when it turns opaque on the sides all the way to the top and there is no more translucent pink visible (see picture above). The flesh should be moist, tender and flake easily if tested with a fork. How long you need to cook it until it gets to there depends on the type of salmon, the size and thickness of the fillets and the strength of your stove burner/the calibration of your oven. Generally pan seared salmon is done when a food thermometer inserted in its thickest part registers 140-45 F. This may take 4-6 minutes on the stove top over medium-low heat OR 8-10 minutes in a 450 F oven. The residual heat from the pan does the job – keep them skin side up for 60-90 seconds. Whether you chose to have salmon with or without the skin is a matter of personal preference. The skin actually contains a high concentration of Omega-3 fats, proteins, vitamins B and D and phosphorus. Very carefully insert your fish spatula just under the flesh while gently holding the fillet (see image below). Apply slight pressure in a forward horizontal motion staying close to the crispy skin and it will separate easily. Chris doesn’t like salmon skin whereas I go bonkers for it. Until recently I’d intentionally portion our salmon so that I have a smaller piece, knowing that I will be enjoying the crispy skin of both Chris’ piece and our kiddo’s in addition to my own. Then kiddo got clued in about the tasty skin and won’t let me have his, soon we’ll probably be sharing Chris’. TIP: Consider placing the fish onto a paper towel to drain excess fat first. Especially if you plan on using it in a salad etc. You can serve the salmon fillet right away and drizzle it with a sauce or brush it with a glaze. TIP: Browse the sauces for salmon recipes I’ve rounded up under the recipe card. There are quite a few – including the decadent Gose Beurre Blanc you see in the pictures. Pan seared salmon cooked to perfection, including a crispy skin. 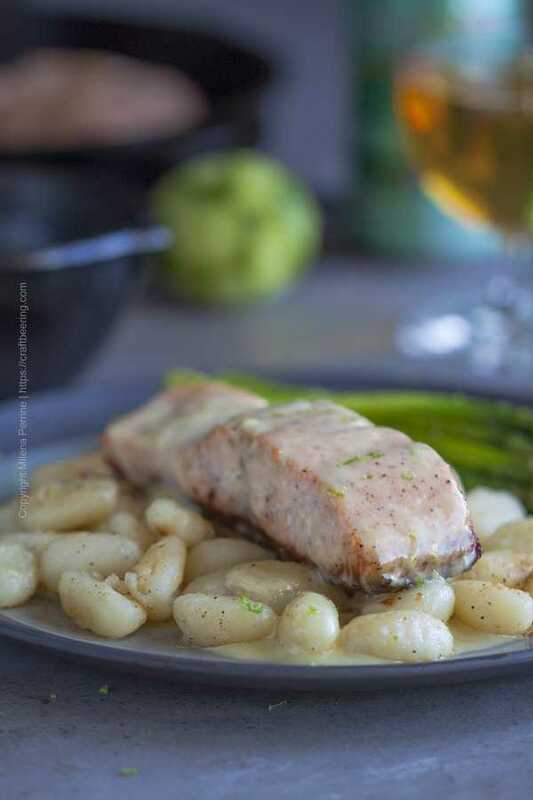 Serve with one of the many delicious sauces for salmon referenced - creamy, mustard, dill and more. Bring the salmon to room temperature and turn the oven on to 450 F (if you're planning on finishing the salmon in the oven). 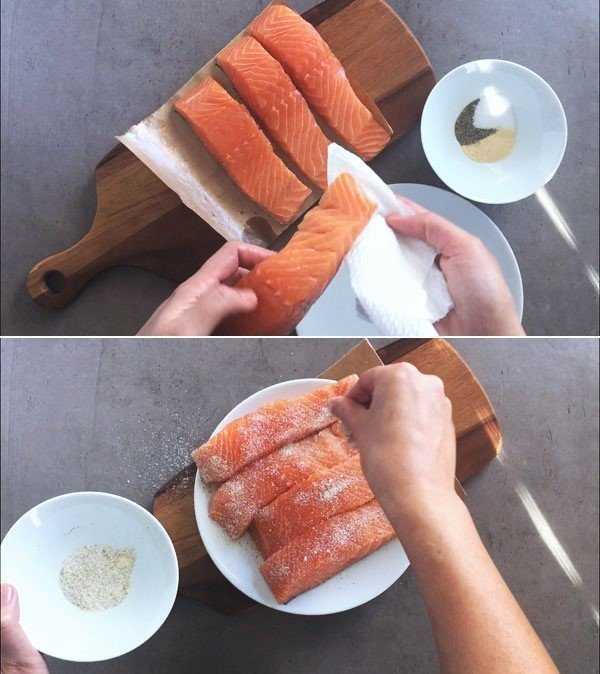 If your salmon fillet is a whole piece, slice it in 4 equal portions. Check for any small bones remaining and remove them if present. Pat dry the salmon fillets with a paper towel - no moisture should remain on the surface. Season the salmon fillets with salt and pepper, optional garlic powder or other appropriate seasoning of your choice (liberally but not excessively). Heat an appropriately sized stainless steel pan or cast iron skillet (10 or 12 inch diameter) over medium-high heat and add the oil. When the oil is shimmering and just about to begin to smoke gently place the salmon fillets in the pan with the skin side down. Gently press onto the fillets with the back of a fish spatula to prevent the skin from curling up. After about 30 seconds transfer the pan to the pre-heated 450 F oven to allow the salmon to finish cooking evenly. Cook until the internal temp in the thickest part of the fillets reaches 140-145 F or until the salmon turns opaque on all sides, all the way to the top. About 8 minutes. Alternatively, after 30 seconds lower the heat to medium-low and allow the salmon to finish cooking on the stove. 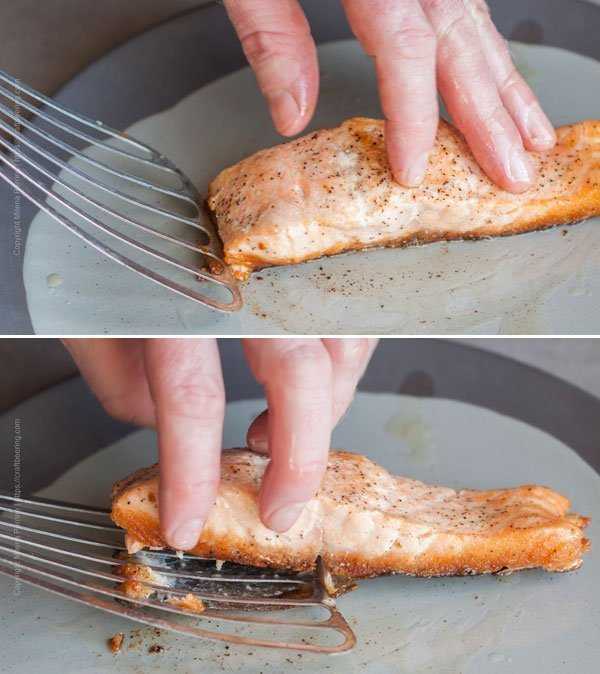 Remove the salmon from the oven or stove top and using a fish spatula and a fork to assist you gently flip the fillets onto their tops (skin side up). The residual heat from the pan will crisp up and lend color to the top of the fillets. About 60 to 90 seconds. Serve and drizzle with sauce or apply glaze with a brush. If you'd like to remove the crispy skin before serving the salmon consult the relevant section above this recipe showing you how to do it. 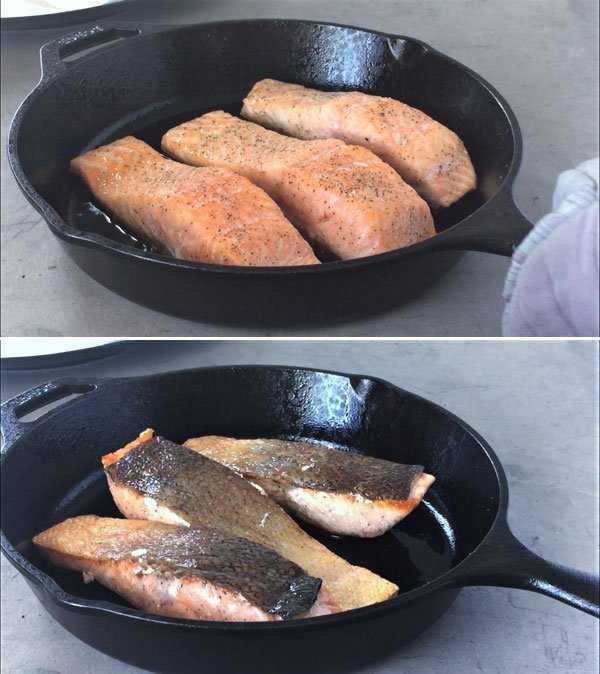 Cooking times will vary depending on the size and thickness of the salmon fillets as well as the strength of your stove/calibration of your oven. For best results prepare sides and sauces for salmon in advance and if needed keep them warm on the stove top near a heat source (not over direct heat) until you are ready to serve. Nutritional info based on portions of 4 oz per person of Atlantic salmon and noted without the addition of sauce or glaze. These easy sauces can be whipped up while the salmon is in the oven or prepared ahead of time. Several of them include a flavor infusion from craft beer. And many of them go well with other types of fish and seafood, even pork chops and chicken cutlets. Honey Mustard Sauce – In a small bowl whisk together equal parts of Dijon mustard and honey and season with a pinch of salt and pepper. Adjust to taste by adding extra mustard or extra honey. Optional – add a splash of soy sauce (to taste) or OJ/beet juice (to taste). 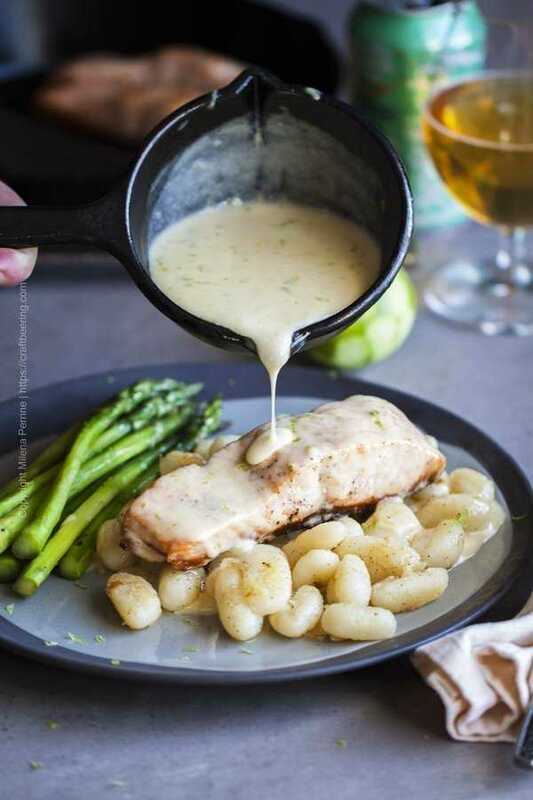 Creamy (Beer) Mustard Sauce – In a sauce pan over medium heat whisk together 1 cup heavy cream and 2 tbsp beer mustard (sub with Dijon mustard). Add 1/2 tbsp brown sugar (optional) and season with salt and pepper to taste, whisk again. Let simmer until reduced to your desired thickness. 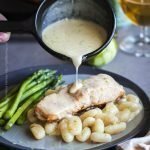 Sour ale butter sauce aka Gose Beurre Blanc – The sauce we made for this post (pictures below) is a creative craft beer play on a French classic. Normally beurre blanc is white wine, dry white wine vinegar, shallots, cream, (a lot of) butter, lemon juice, salt and pepper. Gose beurre blanc sauce for salmon drizzled over a pan seared fillet. We eliminated the white wine, vinegar and lemon juice and used Gose ale instead – dry, citrusy and sour, with hints of salt. Instead of shallots early on we added lime zest at the very end. Absolutely a flavor bomb of a rich sauce – watch the video in the recipe card to see the preparation method, the instructions are below. To make Gose Beurre Blanc – In a sauce pan over medium heat simmer 1/2 cup of Gose ale until reduced to about 2 1/2 tbsp of liquid. Add 1/3 cup of heavy cream, pinch of salt and pinch of white pepper. Whisk and simmer to thicken it until it coats the back of a spoon. Remove from heat source for 1 minute and reduce heat to low. Place back on the stove (low heat now) and start adding cold butter one tablespoon at a time while whisking. Do this until you use up all 2 sticks of the butter. 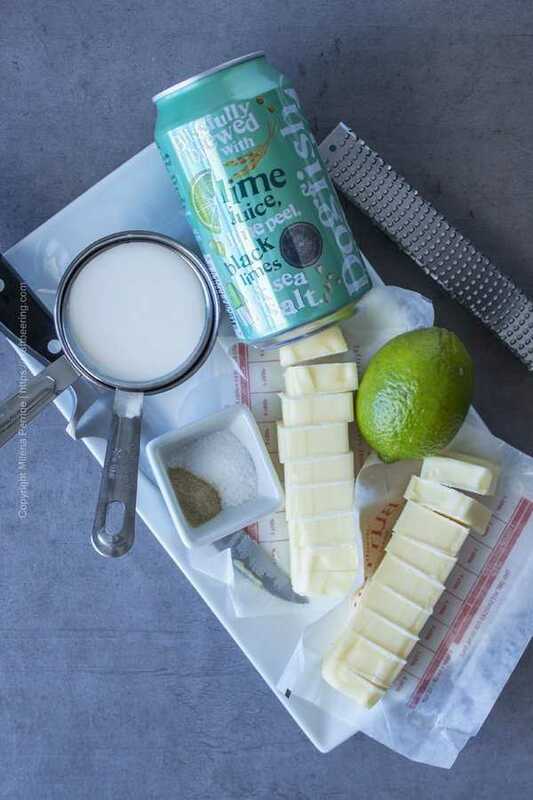 Add the zest of a lime, whisk it in and taste. It shouldn’t need more salt, but if it does add some. Use the silky sauce right away or keep it near a heat source to remain warm, but do not let it heat up or try to do so – it will break. Lemon Butter Sauce – In a sauce pan over medium low heat melt one stick butter, add 3-4 minced garlic cloves, whisk in 4 tbsp of lemon juice, whisk in 1 tbsp of cream and season with a pinch of salt and pepper to taste. Whisk for another minute or two until well emulsified and remove from heat, but keep warm. (You need not worry about the silky consistency with this one). Dill goes with salmon superbly and there are several ways you can make a dill sauce. Here are four easy options. In a small bowl whisk together a 1/3 cup of mayo, a 1/3 cup of sour cream/creme fraiche, 1 tbsp minced fresh dill, 1 minced garlic clove, 2 tsp prepared horseradish (omit if you don’t like horseradish), 1 tsp fresh lemon juice. Season with salt and pepper to taste. Add 1 tablespoon of finely chopped fresh dill to either of the butter sauces above. Add the dill at the end, once you’ve made the sauce and removed it from the heat. Add 1 tbsp of finely chopped fresh dill to the honey mustard sauce above. For a super healthy option make our Easy Yogurt Dip with Dill. Garlic Parmesan Cream Sauce – In a sauce pan over medium heat melt 2 tbsp butter and add 2 cloves of minced garlic then stir it around. Add 1 tbsp flour, whisk until incorporated and add 2 tbsp of water then whisk for a minute. Add 1 cup of cream, whisk together and bring to simmer. Let reduce a bit. Remove from the heat, add 1 cup of grated Parmesan, whisk it in and taste. Season with salt and pepper as needed. If you’d like a bit of heat – a teaspoon of chili flakes really works wonders if added here. 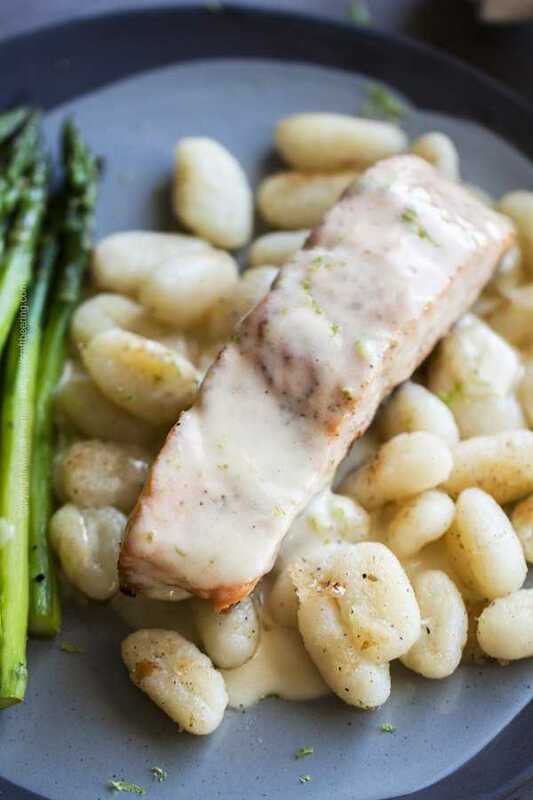 Capers and Shallots Cream Sauce for Salmon – In a sauce pan over medium heat melt 2 tbsp butter and add 2 finely minced shallots and 1 tbsp capers. Stir around and let shallots soften. Add 1 tbsp flour, stir until incorporated and add 2 tbsp of white wine (or water), then whisk for a minute. Add 1 cup of cream, whisk well together and let simmer until reduced to your desired thickness. Season with salt and pepper to taste. These are sauces you will brush onto your salmon fillets. You may do so once the salmon has been seared and you are about to move the pan to the oven to finish cooking and then again once it is done. Or only after it has been cooked and serve a small dish with the rest of the glaze for extras. Brown Ale BBQ Glaze – In a sauce pan over medium heat simmer 1/2 cup brown ale until reduced by half. Whisk in 1 tbsp of brown sugar and 1 tbsp of butter. Once dissolved/incorporated add 1 cup of your favorite BBQ sauce, whisk well, simmer for 2-3 minutes and remove from heat. Brush the glaze over salmon. Honey Garlic Soy Glaze – In a sauce pan over medium heat whisk together 2 tbsp water, 3 tbsp soy sauce, 3 tbsp honey and 4 minced garlic cloves. Bring to simmer and let reduce until it coats the back of a spoon. Miso Ginger Glaze – In a small bowl whisk together 2 tbsp of miso paste, 1/2 tsp of grated fresh ginger and 2 tsp of lime juice. Slowly add 1 tbsp of vegetable oil while continuing to whisk. Taste and add a bit more ginger if needed. You can also consider this IPA Teriyaki or a Beersamic reduction glazes. We like to match the sides to the flavor profile of the sauce for the salmon or its dry rub. For example gnocci browned in butter and pan seared asparagus went really well together with the Gose beurre blanc. Roasted young potatoes or potato wedges and a simple green salad are perfect additions to salmon with dill sauce. Or with the Brown ale BBQ glaze – coleslaw and mashies or fries. If going with a flavorful salmon seasoning and no sauce the bright notes of Pineapple Salsa are perfect and the result is an incredibly light meal. We love pairing fatty Atlantic pan seared salmon with crisp sour ales such as Gose or Berliner Weisse. Highly carbonated wheat beers are also a great match – Belgian wits and American wheat ales are our favorite. That is a good looking salmon! Cooked to perfection, with an interesting, terrific sauce! What a great meal this is! Ooooh – I love that crispy skin! I have fallen in love with salmon – just this year – so this will happily be added to the rotation!! Love it! Pinned! Fast and easy dinner for sure:) Make a quick pasta salad, add a pan seared salmon fillet on top:)… Thanks, Annie! What beautiful salmon and I’m definitely with you regarding pan searing and that crispy skin 🙂 Loving the sauce ideas, too! I’ve never thought about searing the salmon on the stove and then finished cooking in the oven. What a great idea! I must try that next time! I always cook them on the stove and I think as you said, they cook more evenly in the oven! It is really easy and makes for a quick dinner. I think that the sauces sometimes take longer, lol! Salmon is my favorite fish, but I don’t like preparing it; I usually only eat it when I visit my parents. But this looks much easier than the way my dad cooks it so I’m going to try your method next time I find some good salmon. Yum! It’s been a little while since I’ve had salmon and totally craving it lately, especially after seeing your pan seared salmon! Bet it pairs beautifully with that lemon butter sauce. Can’t wait to try 🙂 Pinned! Thank you, Dawn! Yes, the lemon butter sauce for salmon is pretty easy to whip up and has such a great flavor punch!